#Win John Lewis goodies for Christmas! 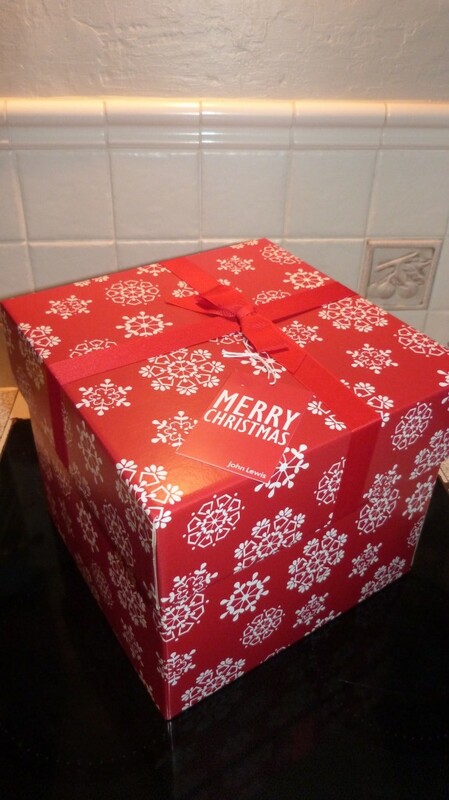 Now, if you’ve read one of my previous blog posts, you will know that I was over the moon when I was offered a John Lewis Christmas hamper to review. I love all things John Lewis, and I am a bit of a foodie, so I really couldn’t have been offered anything better! How about that for a WOW selection? What I love about it, is that somebody has obviously put a lot of thought into selecting the items for the box. All the goodies chosen will appeal to everybody. Who doesn’t adore chocolates, fruit cake, wine, biscuits and mince pies? There is nothing included that is an acquired taste that would only appeal to just a few. Retailing at £50 I think that this hamper box is a really luxurious, safe, gift for friends and family. Whether it’s your matron aunt, brother-in-law, or your dearly beloved. They will all be delighted to receive it on Christmas Day. The only thing they won’t be delighted about, is having to share it with everybody present! …. and when the sad day comes, and the box is empty, you will be left with a pretty, sturdy box in which you can store any manner of things. The Snowflake Hamper Box is but one of a huge selection of delicious hampers to suit all pockets, from £15 to £800 and to suit all tastes, from savory, to sweet, to alcoholic! They even have a build your own hamper set, so that you can make up your own. Apart from the hampers, John Lewis have a plethora of Gift food, wine and champagne all of which would make splendid presents for colleagues, friends or family. In fact, you can solve all your Christmas present needs at John Lewis, I do! This entry was posted in Uncategorized by Country lover. Bookmark the permalink. Ahah, thanks Liz I thought so too, nothing to really dislike… No olives, tinned artichokes, oysters, samphire, or other not-so-tasty things! Hold on to your purse strings in Waitrose, there’s so much that is tempting! I don’t know myself, got my knickers in a bit of a twist. Don’t know what your fans or friends are called on FB, or is it likers?? I’d rather it was like blog than FB, because I don’t use that much, prefer Twitter, thanks! Oh how lovely thanks for entering! Yes, my first ever review, god knows why the contacted me, I have hardly any blog followers. But they must have seen me somewhere out there in the Bloggersphere! Couldn’t be better for me, like you I love ‘em. They didn’t ask me to run a competition, just thought it would be nice to share something with somebody. I chucked in the £10 voucher for good measure. I hope that it all measures up to what they expect from their bloggers/reviewers. I was contacted by another company to do the previous post for World Toilet Day too! (Fame at last!) Did you read my little toilet story? It was scary at the time! Good luck! Yes, what a lovely product to review! Good luck and thanks for stopping by! Following on twitter @astrongcoffee1 have sent freind request. Is that right of should I like a page? Tweet me if I’ve done it wrong! I think Louise, I was a little confused, don’t know whether, on Facebook, you have fans, friends, or likers. I don’t use FB much would prefer a blog like, if that’s what it’s called!! Thanks for the friend request, but I’m not sure what a friend request is… oh yes for me to like, or be a friend with you, I think. #seniormoment ! Thanks again Louise, good luck! Have done all of the above, lovely giveaway. Brilliant, many thanks, and good luck! What a lovely prize! I’ve tweeted @ljbarton and sent a friend request on FB. But what a gorgeous set to review! Great stuff, many thanks Lucinda. Good luck! Thanks very much, that’s great. Good luck! I want to #win a tasty #JohnLewis treat and a £10 gift voucher. It all looks yummy! I have tweeted and posted. Great competition idea. Thanks for your kind words and for entering my competition. Good luck! Thanks to you too, Elaine. Good luck!